Can I explain to you all how excited this Indiana-girl gets for any type of beach vacation!? Because, hello! You really can’t get much better than sun, sand, and waves. My roommates from college and I all knew we needed to reunite this summer for an epic girls-getaway, and we decided on Hilton Head, South Carolina! I have been to the Carolinas numerous times, but never Hilton Head, so I am super excited to check it out! I thought I would bring you all along on my packing journey, in case this is any help to you! Our trip will be six days and five nights, and I wanted to pack a variety of outfits for whatever we end up doing, without overpacking. Some of you may still think this is way too much to pack, but for this serial over-packer, it’s not too bad! I think I did an okay job if I do say so myself. Underneath each photograph, I will try to explain a little bit of my thinking behind why I chose to pack each item. I also linked each item, although it may not be the exact item…I tried to get as close as possible! 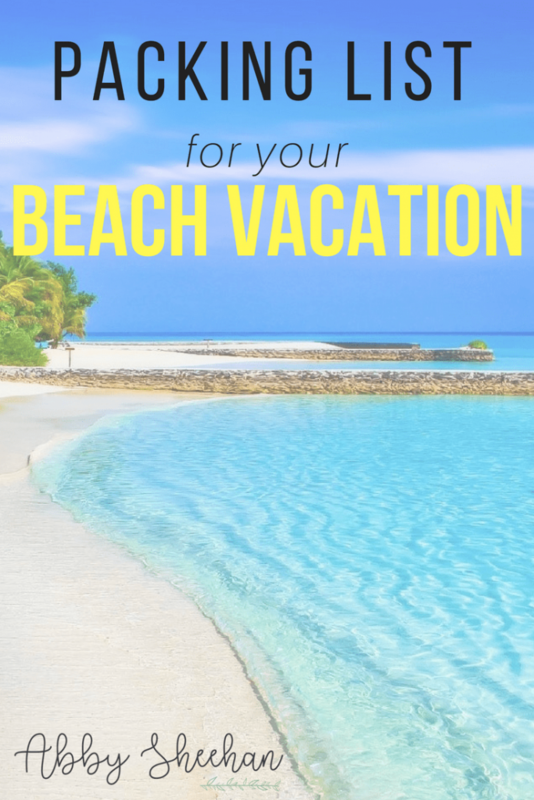 Hopefully, this post can give you some inspiration and ideas on how to not overpack and what essential clothing items to bring to your beach getaway! And stay tuned, because I will be posting exactly what makeup I am bringing as well in a separate post in a couple days. 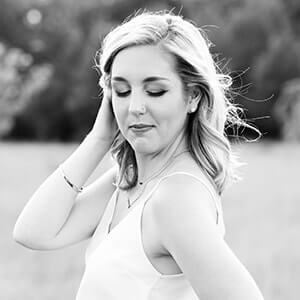 Without further ado, let’s get into what I’m packing for my five-night beach girls trip! Far left: beach slip-on’s. Middle left: cute/casual pair. 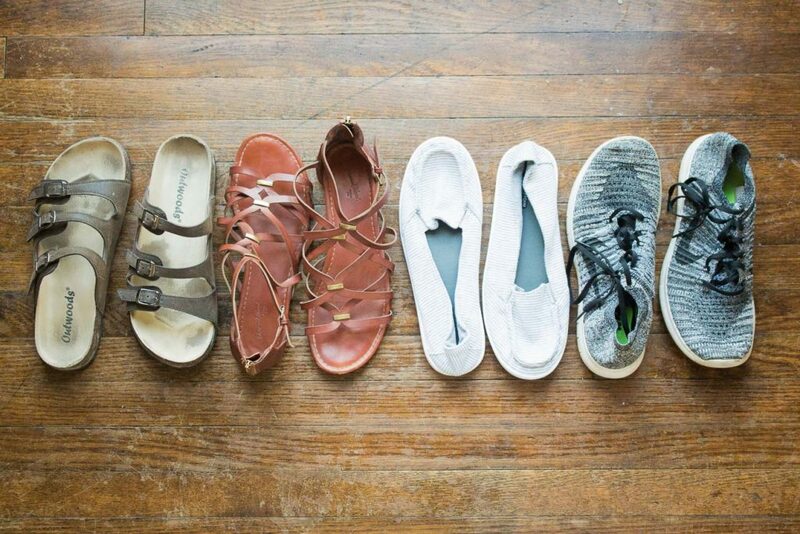 Middle Right: easy slip-ons for walking around. Far right: tennis shoes for long walking and working out. Tip: always wear your heaviest shoes on the plane. I plan on wearing my tennis shoes, as they are the heaviest and the comfiest. The other two pairs of shoes will be used for cute/casual/slightly dressy outfits. Also, just a side note, I am totally not a heels person (hello…I’m already almost 5’10”), but don’t forget a pair of cute strappy heels if that’s your jam! Far left: casual jean shorts, probably for a bathing suit cover-up. Middle left and right: casual daily shorts. Far right: cute/dressy/flowy shorts. 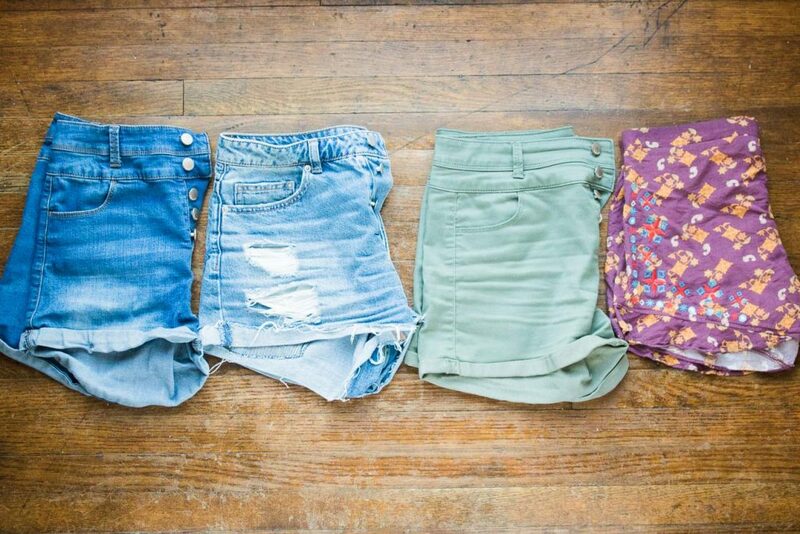 I think all of these shorts are very versatile and allow me to come up with a combination of outfits! Any of these can be dressed up or down depending on the top and shoes, giving me a plethora of outfits to choose from, depending on what we end up doing. I’m packing one pair of “dressy” shorts (far right) for dinners/evenings! Left: flowy sundress. Right: black cami romper. Again, I love that these two dresses (well, one dress and one romper) are super versitile and can be dressed up or down! Between these two options and my two kimonos, I have four outfits ready to go! And all super comfy, lightweight, and don’t take up too much room in my suitcase. Top left: flowy white cami. 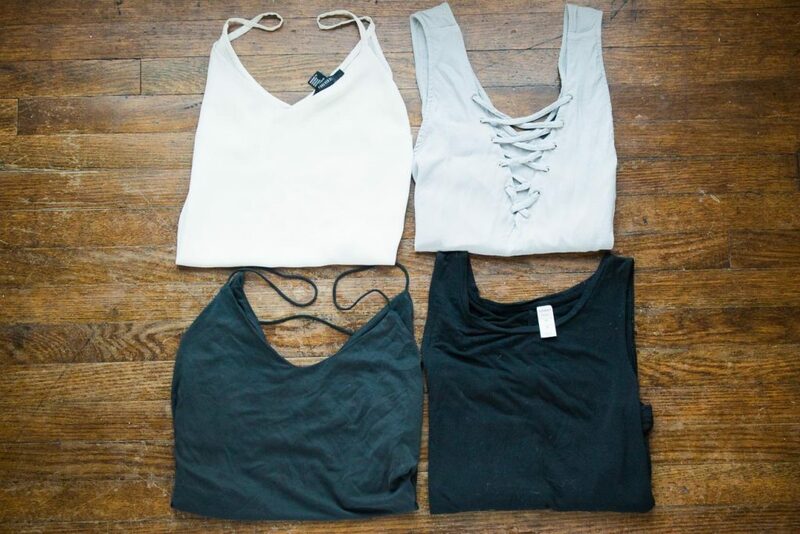 Top right: flowy dark grey crop top. Bottom left: flowy grey crop top. Bottom right: plain black tank top. 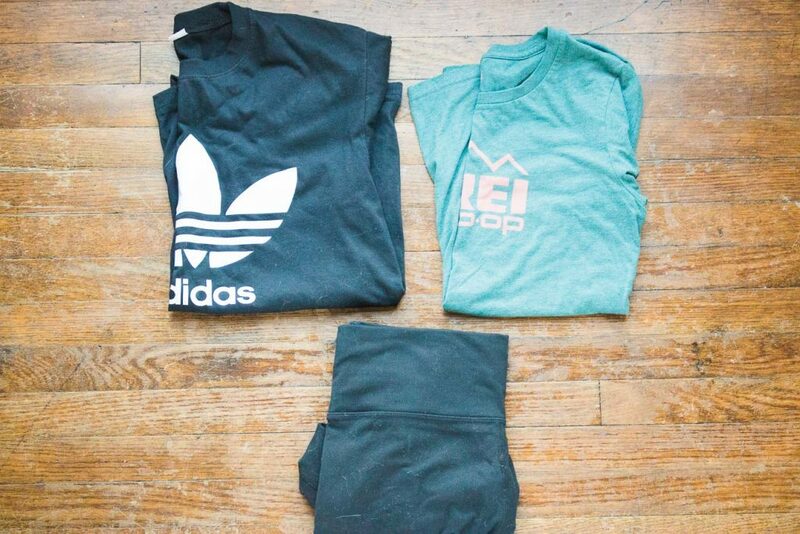 Welp, if you haven’t figured it out by now…versatile is the name of my game when it comes to packing for vacay. As you can see, all four of these tops can be dressed up or down, depending on my bottoms, shoes, and accessories! I also am bringing along the four bralettes you will see below, which look super cute paired with any of the tops above. Left: grey flowy short sleeved shirt. Right: light pink criss-cross neck short sleeved shirt. Just in case I feel like going with something short-sleeved instead of a tank top, I’m throwing in these two options as well. I may use either of these for bathing suit cover-ups or a quick shirt to throw on over anything! Left: flowy, decorative kimono. 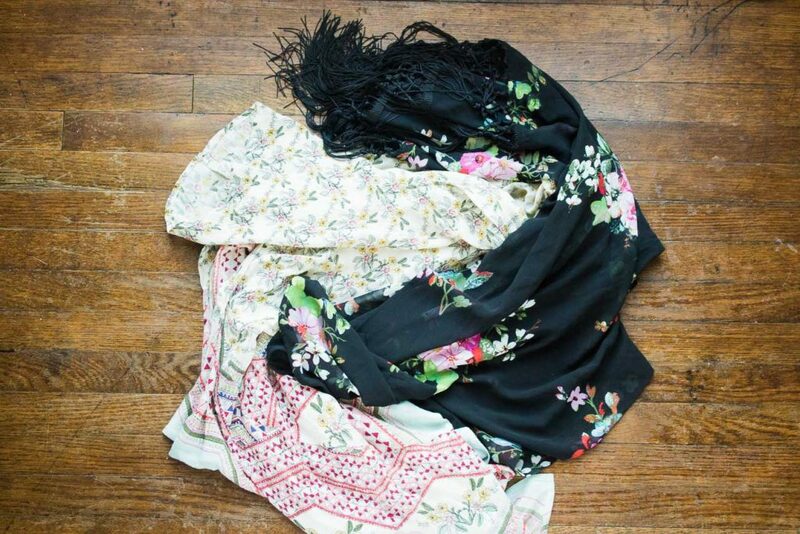 Right: dark floral kimono. Both of these options will immediately dress up any outfit I have packed! Honestly, I am sure I would be fine bringing just one, but I just simply couldn’t pick! Thankfully, they are super lightweight, so it wasn’t a problem to throw both in my suitcase. Left: long-sleeved shirt (from another vacation) for evening time/sleeping. Right: light sweatshirt for chilly evenings or throwing over other shirts. 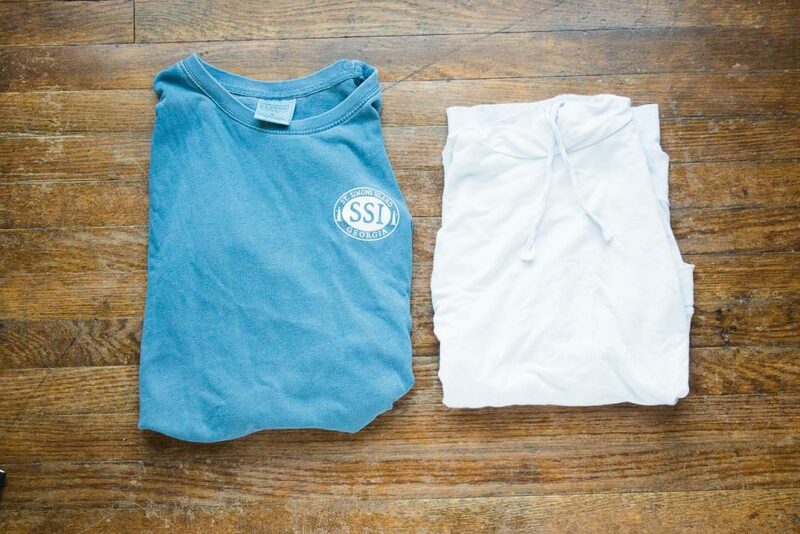 Even though we will be in smokin’ hot weather, throwing in a couple options for chillier evenings doesn’t hurt! I also love cozying up in these in bed and to sleep in! Left: cute green one-piece. Middle: plain purple bikini. Right: classic blank bikini (top here, bottoms here). I am sure we will be swimming more than three times, but any more than three suits isn’t necessary! I will rinse these out in the shower if need be. Top: two sports bras. 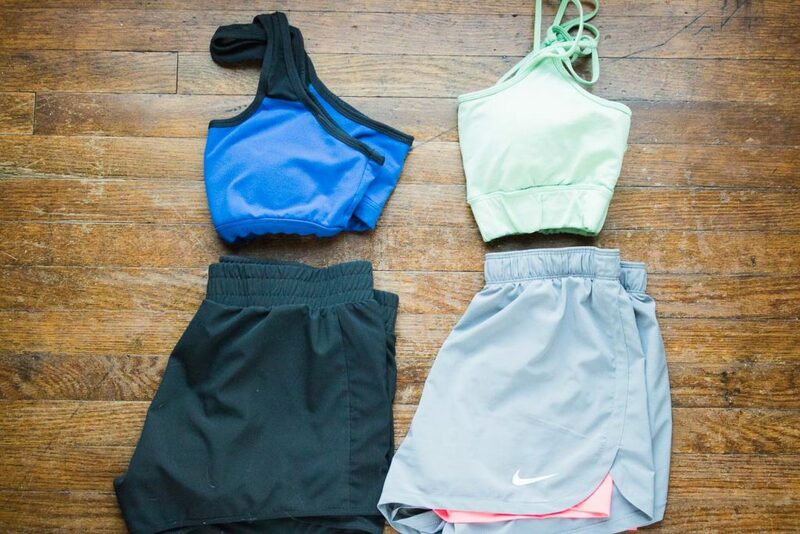 Bottom: two pairs of athletic shorts. These are great options for lounging in the morning, or to use if I am actually motivated enough to get myself to work out! Left: black leggings. 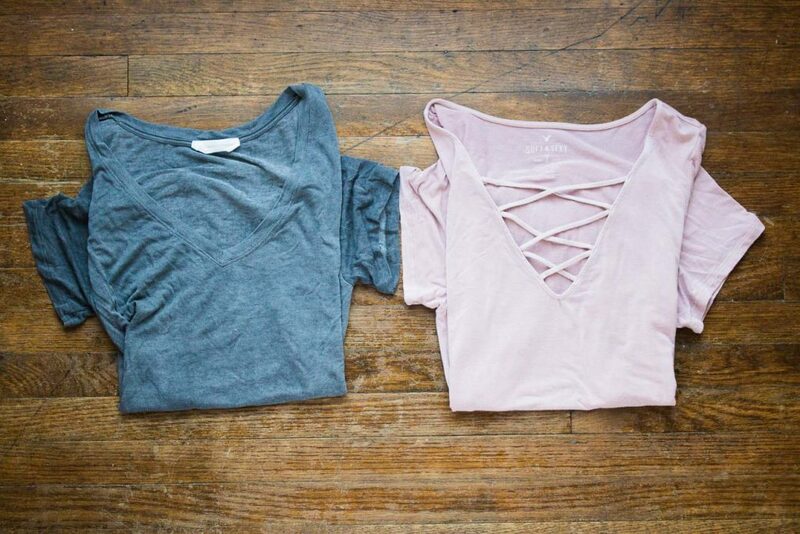 Right: comfy workout t-shirts. I believe I will be wearing the black leggings on the plane. I think leggings are so comfortable, they are my go-to for plane travel! The two t-shirts above will also be used for lounging/working out. 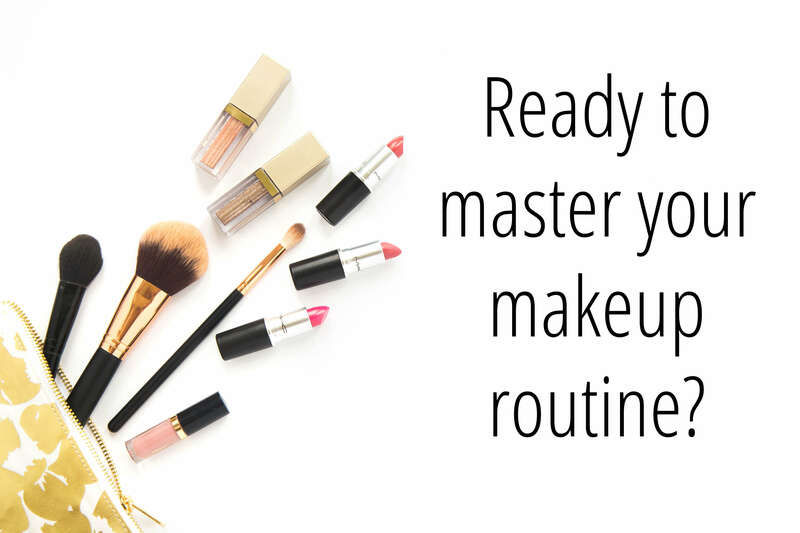 makeup…but stay tuned for that post coming! Alright guys, hopefully this was helpful for your next packing endeavor! 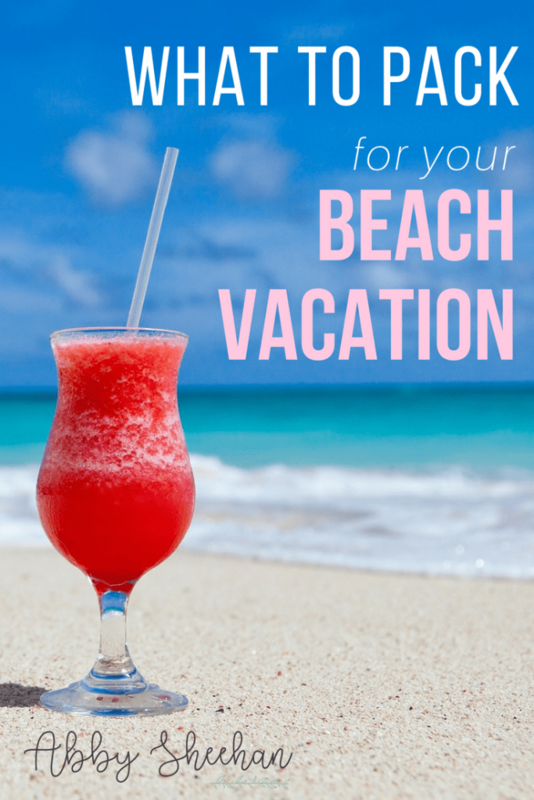 Let me know in the comments below what your necessities are for a beach vacay! 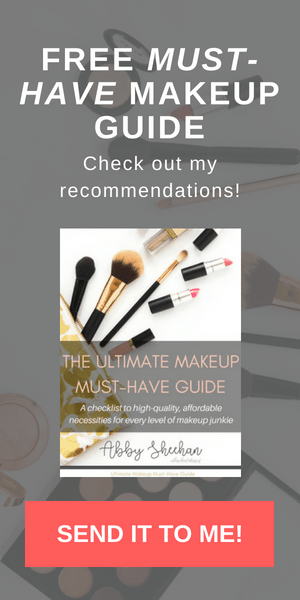 And don’t forget, if you’re not already…snag your FREE “Ultimate Makeup Must-Have Guide” that will leave you wondering how you ever went without this little miracle in your pocket!